On a mid-90s roll, some of the team behind the Final Fantasy games broke off to create a follow-up to Square’s 1991 Game Boy title, Seiken Densetsu (aka Final Fantasy Mystic Quest). This sequel was intended to be a more ambitious and action-driven type of RPG for the – then forthcoming – SNES CD add-on. 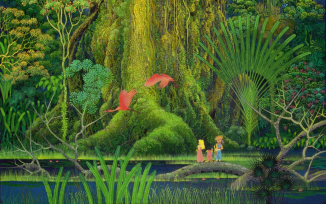 When the relationship between Nintendo and Sony broke down, Seiken Densetsu 2 was repurposed for cartridge and released in the West as Secret of Mana. In this podcast, Leon, Brian, Josh and Leah see if they can (re)discover the magic of Randi, Primm and Popoi’s colourful and whimsical adventure. Cane and Rinse 329 was edited by Jay Taylor. Thought I'd drop by and write in since Leon was lamenting the lack of positive contributions from the community, especially on the remake. I'm not a huge fan of the original game despite playing it a lot back in the 90's--I would probably come in somewhere in between Leah and Josh and the other two gents if I were to write a review of it today--but I found the remake interesting for a few different reasons. First, it's an oddly faithful remake, with some bizarre attention to detail. There's some quirky character animation patterns in the original that are precisely replicated in the new engine. For example, how Elliott flails about when the sinkhole is opening up in Potos, or the "cheat" of the player characters walking up to and behind the travel cannons to get inside. I honestly can't tell if this was simply painstaking attention to detail or if the devs dug around in the original game's code and found a way to import it for these scenes into the new program, as a shortcut. Also, much has been said on the review sites about how the remake preserves the original game's warts, so I won't belabor that. It has brought up some interesting conversations, though, about how games from this era used to rely on instruction manuals. There's no description in-game of what the various consumable items do, and a player has to go digging into the menus to get details on what the spells do and the special properties for each weapon. Considering all this is (intentionally) retained in the remake, it adds up to more of this same sense of fidelity to the original game. I can't think of another remake that went out of its way to stay true to the original in certain specific ways. I feel like, in a lot of ways, it's how a fan remake would have turned out if a bunch of purists were on the team. I don't think this is necessarily a bad thing on its face, but I can see why it led to lower review scores. I personally didn't mind the 3D update. It did occasionally lead to unexpected trouble with enemy ranged attackers and I understand the nostalgia toward the sprites, but I genuinely appreciated the increased level of detail, especially on the enemies (yes, Tomato Man/Eggplant Man was updated). There aren't any mouth animations for the voiced dialogue though. That was particularly jarring for the added scenes in the inns, which I thought were otherwise a cute and welcome addition. I ended up developing a headcanon of everyone talking to each other telepathically, like the Protoss from Starcraft. The soundtrack has been much-maligned, and its inconsistency surely stems from the fourteen different composers doing arrangements. Taken as a whole, it sounds not unlike one of the collaborative projects found on OCRemix. Aside from a couple of especially odd tracks that play towards the beginning of the game and an absolutely brutal Mana Fortress rendition, I wasn't tempted to switch to the original soundtrack. In the end, I'm glad I didn't. There are definitely some improvements over the original on some tracks. "Steel and Snare" goes from a throwaway, repetitive track to one that now rocks, and it elevates an otherwise forgettable dungeon in the process (the Imperial Castle). I also really dug the bass line on "Dancing Animals" (Matango's theme). I don't know if I should recommend the remake over the original to someone new to the game, but I do think the soundtrack is worth a listen, if only to pick out a surprising track or two. I think even big fans of the original should check out "Secret of the Arid Sands," "The Dark Star," "Prophecy," and "Steel and Snare." Thanks for the post Ashtear - appreciated. And I will give those pieces a listen.